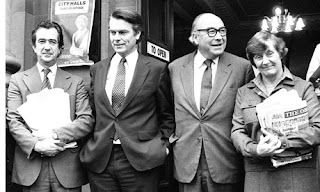 When I first moved to the UK, I was in the process of writing a thesis on the British Political system, particularly the birth of a new party called the SDP. The exodus of a 'Gang of Four' of politicians from the Labour Party was one of the biggest political news in Britain in the 1980's. 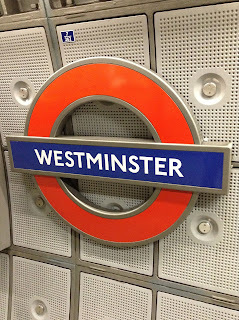 During my research into the thesis, I tried to get to the public gallery at The House of Commons, but never got to go for some reason or other. 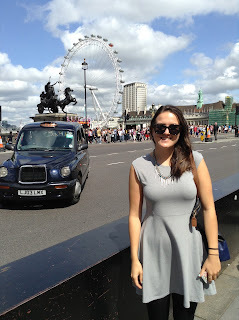 But something quite amazing did happen to me in those early days in London. While walking just outside the Houses of Parliament on a sunny autumn day in 1984, I literally bumped into David Owen, the then SDP leader, and one of the original founders of the party. I was stunned; here was the very object of my study! 'I'm sorry', said David, smiled and hurried on. 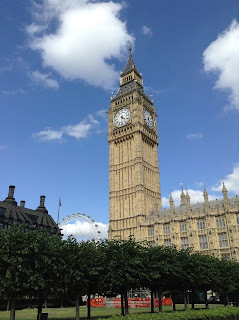 At least a few weeks ago, finally, I fulfilled another desire, that of visiting the British Houses of Parliament. I'd spotted a post by Time Out on Facebook that the Houses are open every day during the summer recess (and now on Saturdays all year around), so I immediately booked two tickets and took Daughter with me. It was a similarly sunny day as it had been on that fateful day when I'd bumped to David Owen, and I could see Daughter was getting quite fed up with me talking about it. 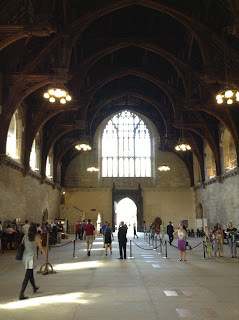 But as soon as we entered Westminster Hall, we were both silenced by the awesome beauty and grandeur of the place. A huge stained glass window at the far end was letting in light into the otherwise gloomy, vast hall. We were led into a queue and soon our tour guide began speaking to us. 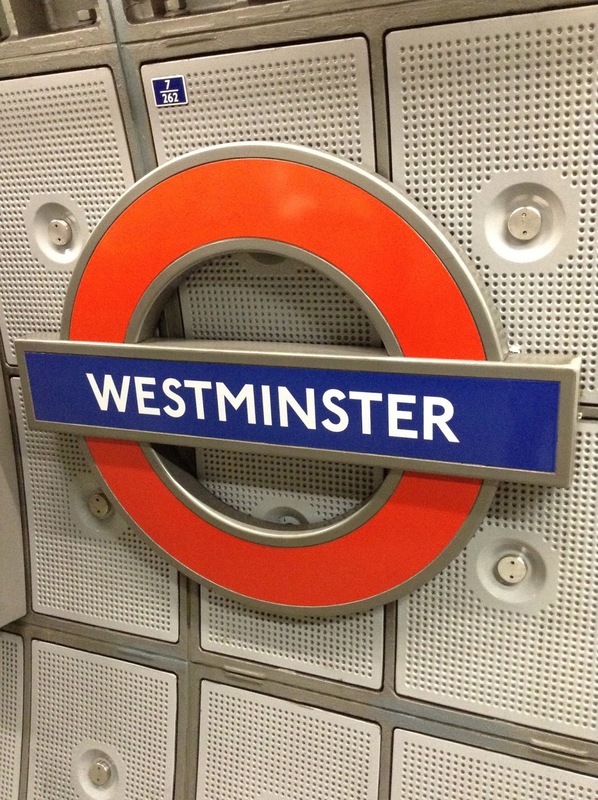 The guided tour of the Houses of Parliament, conducted by a Blue Badge Guide, lasts just over an hour. As well as getting to see both of the Houses, you get a brilliant history lesson on not only the building, but on the Kings and Queens of England and their role in the establishment and current running of the British parliament. And then of course there's the art. As a recent (with Honours!) graduate of History of Art, Daughter often nodded knowledgeably (oh, how proud she makes me!) to the words of the guide. To me, the gilded thrones, Italian mosaics, the hand-painted wallpaper and the stained glass windows all seemed too embellished to be real, but worth seeing all the same. I was more interested to see the debating chambers. Luckily during the tour we had the chance to stand (but alas, not sit), between the benches of both the House of Commons and the Lords. 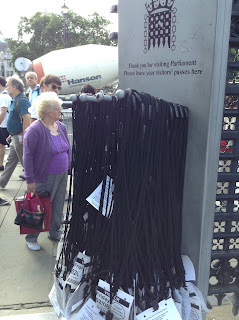 Seeing the green benches of the Commons at close quarters was an emotional experience. I felt as if I'd entered a church. I remembered that for a while in my thirties I dreamt of being a politician, but knowing my uncanny talent of always saying the wrong thing, and not really (at the time) wanting to change my nationality, all those thoughts faded into mere day dreams. Back in the real world, while I stood between the benches where MPs have conducted their heated arguments for hundreds of years, and trying very hard to resist the urge to sit down (and I'm sure be escorted out of the House and even prosecuted for some kind of violation of the code of conduct, and hence scuppering my current efforts to gain British citizenship), our friendly guide told us an interesting fact, which reflected my mood. Apparently the reason the benches are opposite each other, with the speaking sitting at the far end, is because the original parliament was set in a church, St Stephen's Chapel. This is also the reason why the Members of Parliament on entering the Chamber, bow their heads towards the Speaker's chair in a mark of respect, in a similar manner you'd honour an altar. So I wasn't so daft after all, thinking I'd entered a church! The tour was full of little intriguing snippets of information like this. We were also told that, before playing Maggie Thatcher in the film Iron Lady, Meryl Streep, donning dark glasses and a scarf, spent two months coming to the public gallery to watch the MP's. Apparently, once the fact became known, the presence of the Hollywood star began to affect the performances below and some of the MPs became quite flamboyant in their oratory. Our guide also seemed to be quite taken with our current Queen, and her habits. So if, like me, you are also fascinated by the Royals, as well as British politics and history, this is a satisfying way to spend an hour or so. 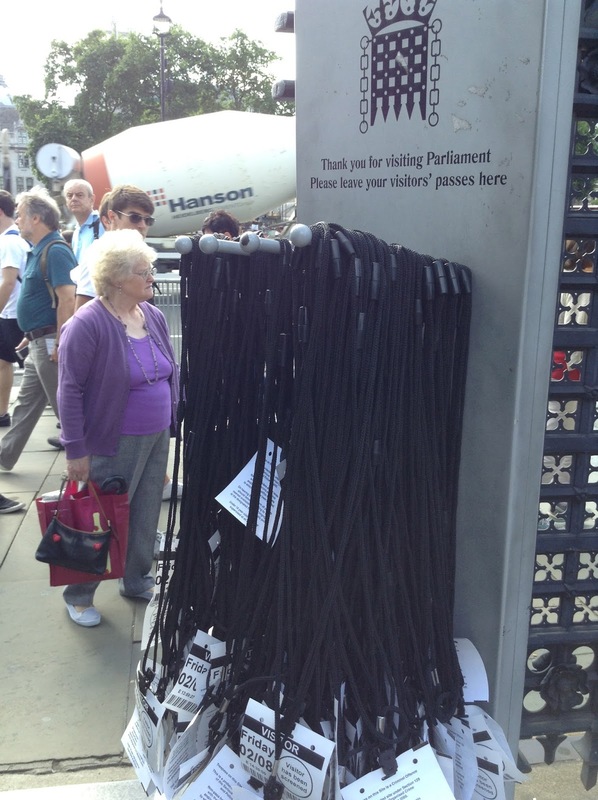 Plus there were no queues; no waiting. We were booked to go for 3m on a Friday, and even though we turned up half an hour early, we were just shown to the next available tour, which happened every ten minutes or so. The badges we all had to wear during the tour. You can also book an afternoon tea after the tour at the Pugin Room, which overlooks the Thames. Please note that tours are not recommended for young children as there is a lot of walking.